The Linegard™ PGFM is a ground fault sensing module that operates in tandem with a UL 489 Airpax™ hydraulic magnetic branch circuit breaker. 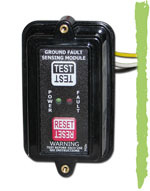 The sensing module monitors an electrical circuit via an external differential current transformer, upon a ground fault, it actively severs the load by means of the circuit breaker. Also available in an ELCI "marine" version. Compatibility : LEL & 209 series with 1 to 3 poles, rated from 1 to 50 amps, with integral shunt coils.